...So, as with many gifts in life: 1. they contain a pang of aching, 2. they are best when shared. 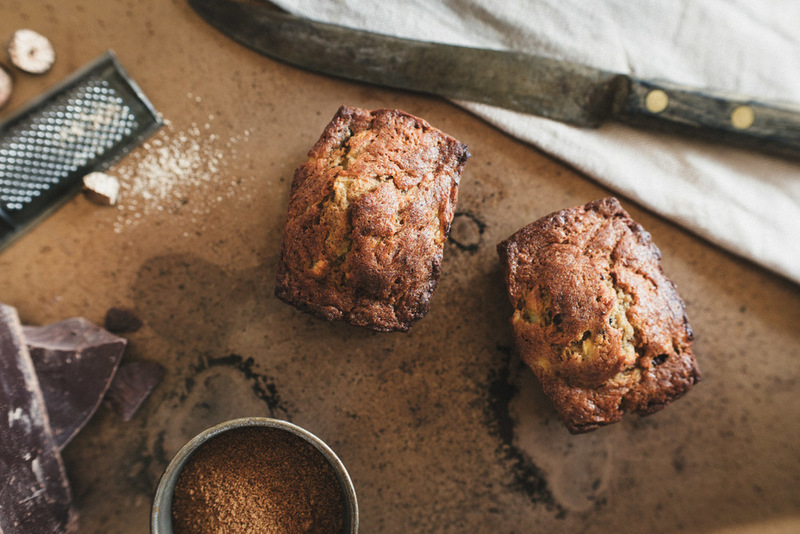 Fortunately, friends never get tired of me dispatching my banana bread into their hands without notice–to save myself from devouring a regrettable amount of carbs in one sitting. So it's a win win; I get to enjoy the romantic process of having bananas ripen slowly on the counter for a week, until they're perfect and ready for our love affair to begin again.... the way the sweet smell of Banana Bread baking in the oven makes its way through the house like some intoxicating potion.... I'm convinced it alters my brain on a chemical level and seduces me into a fevered state of irrational adoration. Not kidding. Without further delay, let me share one of the many forms my Banana Bread Obsession takes: Dark Chocolate Chunk Banana Bread; moist and buttery inside, crisp and caramelized-to-the-point-of-almost-burnt outside. I hope you enjoy baking and devouring such a dear (and highly demanded) recipe from my kitchen. Enjoy, and be warned of its bewitchery. Preheat oven to 350°F. Butter a 9x5" Loaf Pan. In a separate bowl, mash the bananas - I don't puree them fully! I leave them a little chunkier, as it's lovely to bite into small, moist banana chunks. In a separate medium bowl, beat the eggs and combine with the mashed bananas. Pour the egg/banana mixture into the dry ingredients and mix just until combined. Add and stir in the melted butter slowly until until the batter comes together in a beautiful velvety way. Add the dark chocolate and combine fully. Pour batter into the greased loaf pan, and bake for 60 minutes, or until the top is golden brown, and a skewer/cake tester/toothpick/what-have-you comes out clean. If you can resist the urge, allow to cool for 10 minutes before slicing and serving! Take 3/4C Golden Flame Raisins (I buy mine from Peacock Family Farms. LOVE all their goods), and 1/2C of Rum, and put them in a small saucepan over medium heat. Bring just to a boil, turn off heat and cover for an hour on the stove. Drain the plumped up raisins, and incorporate them at the last step (in place of the Chocolate chunks). For an added texture/crunch, add Walnuts to either Chocolate or Rum Raisin variation. I like to toast mine lightly in the oven (or carefully on the stove in a pan - low heat), to bring out their flavor, and keep them crisp once they're baked into the loaf. If you ain't against Gluten, feel free to use equal amounts of Organic All-Purpose Flour instead. KITCHEN TIP - My Loaf Pan was a little small, which allowed me extra batter to bake a couple additional mini loafs (pictured first, and below). Since the larger loaf pan takes longer to bake (60minutes vs, 35 for the minis), it caramelizes to a deep golden brown... If you prefer a lighter/less toasted loaf, I recommend using multiple mini loaf molds, or even a muffin pan!